Khashoggi, a forceful critic of the Saudi government, went missing more than a week ago after entering a Saudi consulate in Istanbul, and Turkish officials have said they believe he was murdered there. President Donald Trump declared the US would uncover the truth about what happened to journalist and US resident Jamal Khashoggi, whose possible murder at Saudi hands after disappearing in Istanbul has captured worldwide attention. Trump promised on Friday to personally call Saudi Arabia’s King Salman soon about “the terrible situation in Turkey”. “We’re going to find out what happened,” Trump pledged when questioned by reporters in Cincinnati where he was headlining a political rally. US officials say they are seeking answers from the Saudi government and are not yet accepting the Turkish government’s conclusions. The Saudis have called accusations that they are responsible for Khashoggi’s disappearance “baseless”. Widely broadcast video shows the 59-year-old writer and Washington Post contributor entering the consulate on Tuesday of last week, but there is none showing him leaving. Both Turkey and Saudi Arabia are important US allies in the region. Trump said Treasury Secretary Steve Mnuchin will evaluate whether to attend a Saudi investor conference later this month. Mnuchin had indicated earlier Friday he still planned to attend. On Thursday, Trump had said US relations with Saudi Arabia were “excellent” and he was reluctant to scuttle highly lucrative US weapons deals with Riyadh. A number of members of Congress have pressed the Trump administration to impose sanctions on the country in response to the Khashoggi affair. Meanwhile, Khashoggi’s fiancee said Friday in an interview with The Associated Press that he was not nervous when he entered the Saudi consulate to obtain paperwork required for their marriage. “He said, ‘See you later my darling,’ and went in,” Hatice Cengiz told the AP. Citing anonymous sources, the Post reported Friday that Turkey’s government has told US officials it has audio and video proof that Khashoggi was killed and dismembered. The AP has not been able to confirm that report. 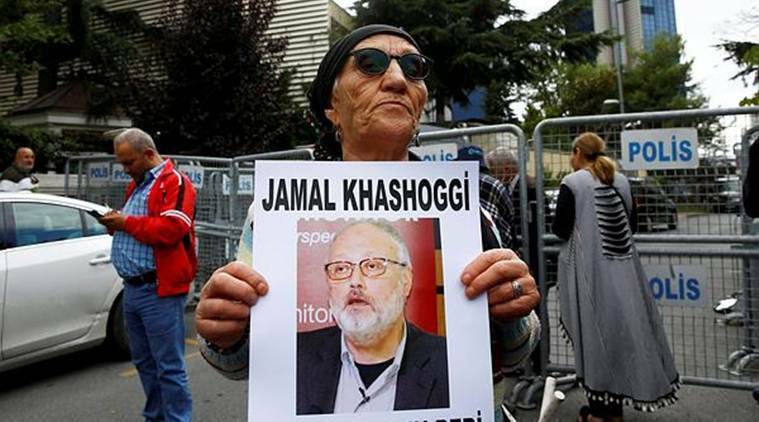 In written responses to questions by the AP, Cengiz said Turkish authorities had not told her about any recordings and Khashoggi was officially “still missing”. She said investigators were examining his cellphones, which he had left with her. Saudi Arabia says Khashoggi left the consulate. He hasn’t been seen since, though his fiancee was waiting outside. Cengiz said she and the journalist would have been married this week and had planned a life together split between Istanbul and the United States, where Khashoggi had been living in self-imposed exile since last year. She had earlier appealed for help to Trump, who earlier this week said he would invite her to the White House. Cengiz didn’t respond to a question about that, but earlier on Friday she urged Trump on Twitter to use his clout to find out what happened. “What about Jamal Khashoggi?” she wrote in response to a tweet by Trump in which he said he said he had been “working very hard” to free an American evangelical pastor who has been held for two years in Turkey. Andrew Brunson was released late Friday. Amid growing concern over Khashoggi’s fate, French President Emmanuel Macron said his country wanted to know “the whole truth” about the writer’s disappearance, calling the early details about the case “very worrying.” Macron said “I’m waiting for the truth and complete clarity to be made” since the matter is “very serious.” He spoke Friday in Yerevan, Armenia, to French broadcasters RFI and France 24. In Germany, Chancellor Angela Merkel’s spokesman, Steffen Seibert, said Berlin was also “very concerned” about the writer’s disappearance and called on Saudi Arabia to “participate fully” in clearing up reports that he had been killed. Global business leaders began reassessing their ties with Saudi Arabia, stoking pressure on the Gulf kingdom to explain what happened to Khashoggi. Khashoggi, who was considered close to the Saudi royal family, had become a critic of the current government and Crown Prince Mohammed bin Salman, the 33-year-old heir apparent who has introduced reforms but has shown little tolerance for criticism. As a contributor to The Washington Post, Khashoggi has written extensively about Saudi Arabia, including criticism of its war in Yemen, its recent diplomatic spat with Canada and its arrest of women’s rights activists after the lifting of a ban on women driving. Those policies are all seen as initiatives of the crown prince, who has also presided over a roundup of activists and businessmen.